It’s one of those rare Dublin days where all you want to do is go outside. We’re just back from the an impromptu picnic in the park, the back door is open and the birds outside are really going for it out there. Everyone’s in a good mood. My recipes this week are an end of season last hurrah for blood oranges and a hello stranger for gorgeous Irish rocket (a mix of 3 varieties!!!) from Denis Healy’s farm in Wicklow. 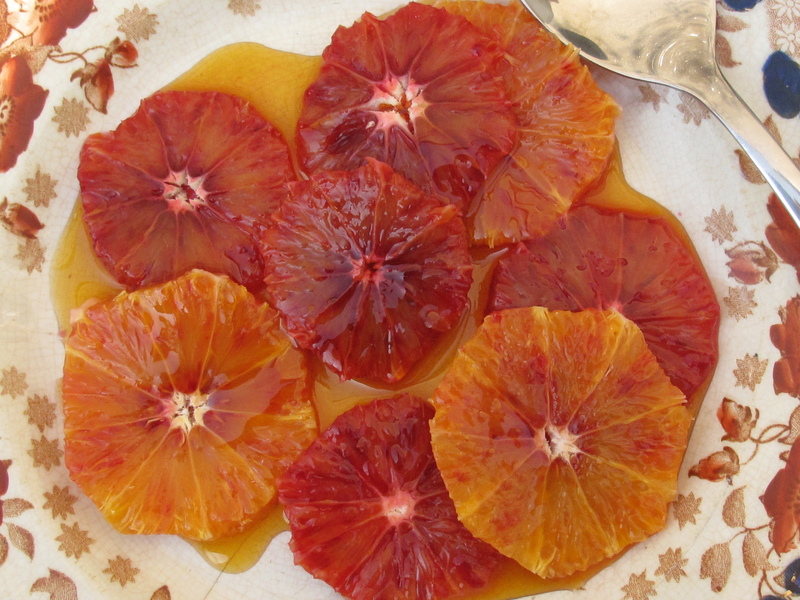 Blood oranges seem to be a winner with pretty much everyone. 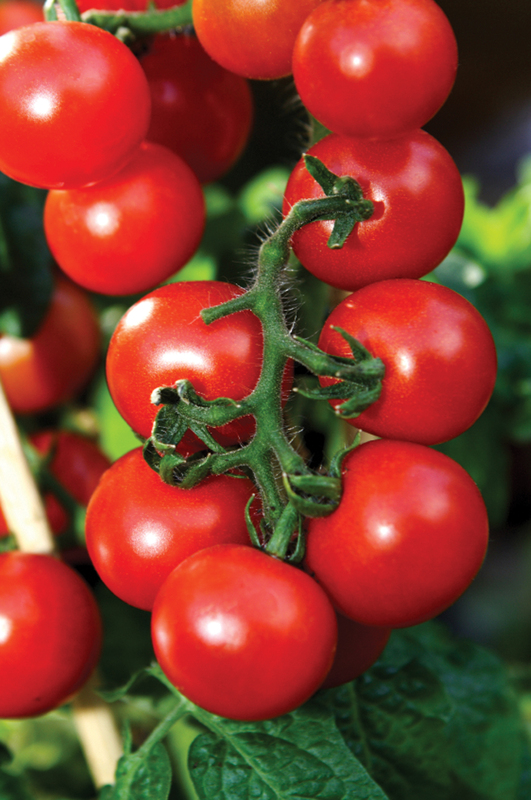 Apart from the amazing colour and flavour, they’re just especially lush. We make juice with them every morning maybe adding the odd grapefruit for tang. It is truly a great way to start the day. Peeled and sliced with a little shredded mint is a very simple but really beautiful way to round off a meal. As you can imagine, this also works well with ice-cream. I also throw them into green salads and recently, as I wrote last week, I’ve had great success with cous cous, Feta and broad beans. I was flicking through Skye Gyngell’s brilliant “How I cook” recently and found a recipe for caramelized blood oranges which I had to try. It’s very easy, just sliced oranges drizzled with a light caramel. Both the oranges and the syrup are served chilled so it’s really refreshing. A dollop of Greek yogurt or a scoop of vanilla ice-cream is a great foil with a light dusting of cinnamon if you really want to impress. And of course chocolate is good too (but you knew that). This recipe is a slighted amended version of Skye’s. Put the sugar and 50 ml water in a heavy pot. Stir once then set over a low heat and leave until the sugar fully dissolves. This will take a good 5 minutes. Turn up the heat a bit and let the caramel start to form and change colour stirring occasionally. 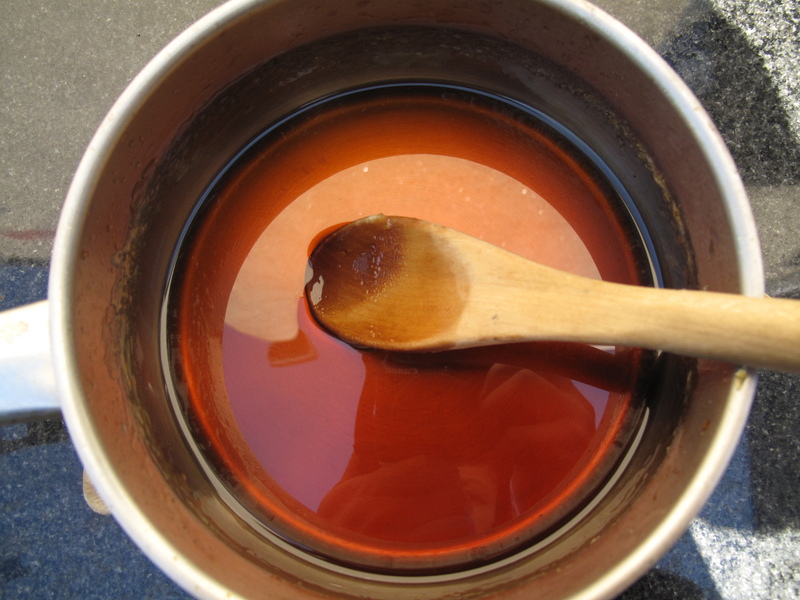 Be sure and keep an eye on things as the caramel can turn very dark very quickly.You want a golden colour and when that happens carefully pour in the rest of the water and stir well. Be very careful when doing this as the syrup is very hot and will spit. A tea towel around the stirring hand is a good idea. 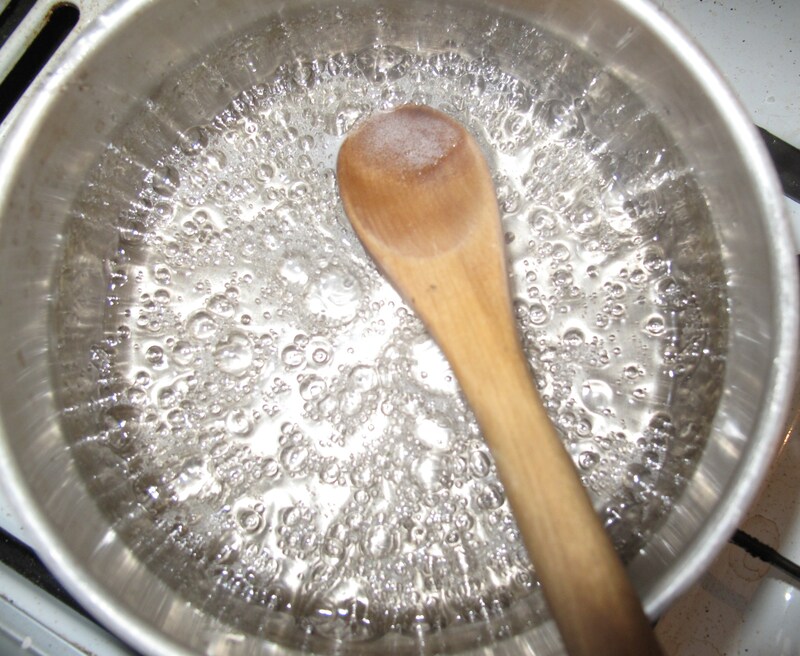 When the water has been absorbed, stir for another minute then take off the heat. Let the syrup cool down before decanting it into a jug or jar. When it has fully cooled down you can store it in the fridge for a month at least. When you are ready to serve simply peel and finely slice the oranges. Lay out on a plate. Drizzle with syrup and serve. Heaven.. 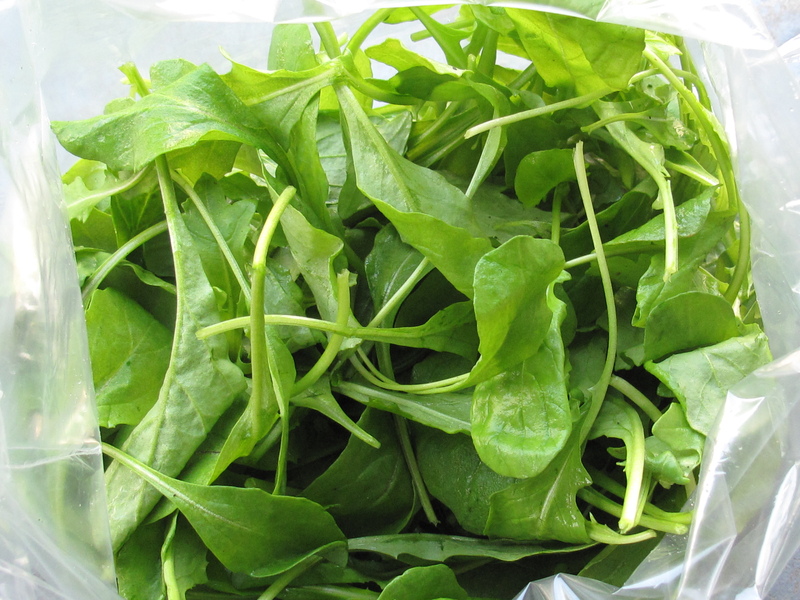 This week’s rocket is what local seasonal eating is all about. Picked first thing at the Healy’s farm it’s spanking fresh and bursting with flavour. It hasn’t, however, been sprayed a million times so is fragile and should be eaten ASAP. Here are a few ideas…..
Really the combinations endless. What are your favourites? Please share!! Oh and one final thing, this week sees the last of the season’s celeriac (that big gnarly thing in your bag). Mash, roast or turn it into soup or there’s smashed with spud and green chili and crispy onions from a a few weeks back a recipe I’ve turned to again and again recently. Or there’s Hugh Fearnley-Whittingsdall’s moreish gratin with rosemary and cream. I love to throw a handful of rocket on top of a bowl of pasta that is dressed in pesto or salsa verde. I also recently had a delicious pizza in Piedmonte which had been cooked and then topped with fresh ricotta and rocket. Oh and there’s the classic Italian rocket, pear and parmesan salad which is totally to die for! Those look great and would complement so many things. Thanks for the inspiration. Thanks Rufus. I see from your own lovely blog (those brownies look amazing!!) that you’ve been to Dublin. Did you enjoy the food here? I love blood oranges and rocket…I’m soooooo excited that we have entered Spring…it means so many different produce options. Thanks Gretchen. I’m pretty excited about Spring myself. We’ve had a long winter.Roll on the summer. Thanks for commenting. You blog looks great by the way !